HOME MATTERS is a project of HILLTOPPERS, Inc. which has experience supporting adults to be as independent as they are able and wish to be since 1975. OUR MISSION is to enhance the quality of life of the recipient (enrollee) by providing personal care and homemaker services to older adults and disabled individuals wishing to live as independently as possible in their own home. OUR GOAL is to provide comfort, respect and dignity to Home Matters enrollees through quality, person-centered care. Home Matters is an in-home, non-medical service for seniors and others in need. We provide assistance with the activities of daily living so that senior adults and physically disabled individuals can remain independent in their own homes. From personal hygiene and dressing to meal preparation assistance and light housekeeping, Home Matters provides help around the home when it's needed most. Home Matters services are provided by Personal Care Aides (PCA) who are extensively trained. Each PCA receives a minimum of 40 hours of comprehensive training, with continuing education and ongoing skills training. PCAs are bonded, insured and are American Heart Association certified to perform First Aid and CPR. Unlike CNA training for hospital or nursing homes, Home Matters personal care aides are trained specifically for the home setting. The ratio of care is one-to-one and the enrollee always has final say regarding care. 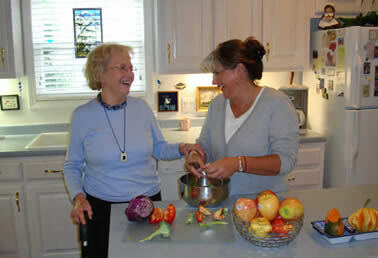 • In-home Respite -- Companionship for an extended period of time when a family member or caregiver needs a break. Services can include personal care and homemaker services.